I remember when I had my blood cycles that the days before its appearance, all things began to rise up from the shadow world. I am a shadow devotee so I am always pursuing it, exploring dark areas where others fear to go. For whatever reason, I was born this way. Not sure where it came from when I look into the past. Certainly not from my parents, at least as the way I understand this approach to the psyche to be. And when I look back into my ancestors, I don’t see psyche pursuers. I definitely see artists and deep life livers, and yes, shamanas of the North Finnish ways. Perhaps that IS what this is all about afterall. So my loves, the Balsamic phase of Luna. Don’t you love the sound of that word in your mouth? resonating in your bones? Something about it is so evocative of the rich mulled brew of Hekate, the Babas, the Crones… who as they approach I both rejoice in AND fear just a little at what they are now going to say. Balsamic means “restorative or curative”… yet for me it points to the restoration and curative powers when I releasing into this stage of dying into death. If we are up for the Balsamic Moon in the wee hours of the morn, we would see she is truly as splendiferous as the New Crescent! yes, She is the *Old* Crescent. The one we don’t see, like the old women who tell us is how they feel in a crowd. Unseen. I remember when this weighty thick hormonal altered state came upon me. The pain building in discomfort, the cragginess of my nature pulling me deeper and deeper into my room, onto my bed, curling up into my body and disappearing if I could. If I was forced out, I was indeed a force to be reckoned with. Quite MAD! Literally. All the phantoms would pour out… those which no one speaks but everyone *else* is responding to. The things done that were covered up, made to look nice, and forced to dance on the stage of life. 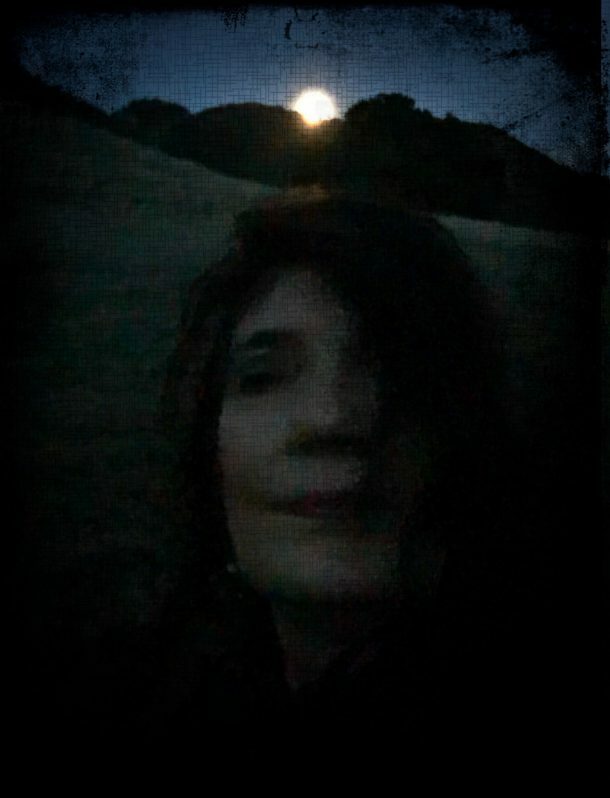 The conscious mind/ego like the brightness of the moon, slowly gives over to the ‘dark side’ , the shadow land, and if I could or had to physically still show up and tend at this point, I didn’t care anymore about how messy and emotional I was…. but in reality, nor could I. The Nature of this side of the metamorphosis cycle of the Moon, is the more radically felt transformation of the bodypsyche, like the chrysalis and the melting of the caterpillars body within it so as to be reshaped and reborn at the New Crescent. SO RAD, when I think of it. There is no greater MAGICK to EMBODY than to know where one is in the cycles of Nature, so one can lean into the forces of nature, give oneself over to them, so as to source the support and infusion of these forces in ones efforts in life and self creation. This is POWER! Stir the cauldron with the truth as you are aware of it in this moment. I explore the shadows. I go after what does not feel right in relationships. And… allow that which isn’t working to be taken from me. Give it up in ritual at the Dark Moon. Consciously engaging with the forces of Nature is what our Astro Witch work is about. Not only are we in the Balsamic cycle of the Moon, we are fast approaching the darkening time of the year. This IS the time of the Harvest. Yes! to harvest our bounty! But also to cut down that bounty and put it into its storage containers for the dark times. To thrash with our scythes that which is time to prune out Our precioussss! To have the courage to look into the eye of that dying death WITH one’s fear… for those who say they do not fear or feel the loss, well they are not I. To bow, honor, and make a conscious sacrifice. The truth of the MATTER is that we are giving our works, our hearts our relationships, our bodies, over to the greater intelligence of Nature, the Unconscious. The Dark Goddesses and Witches. The Dark Moon and the Black Sun… for a time, to remake and reshape, to reinforce and revitalize, support and nourish us as we continue on our long wending life at times, very challenging life journey. The key at this stage for me is to keep my conscious mind and ego malleable enough that I practice staying in the “unknown” long enough to be inseminated by it. If I become too tenacious about what I think the death and the sacrifice should look like, I may let go of more than I am required to or what is true. You will know it by how you feel… both naked and supported, tearful and empowered. Like you really are a creatura of the night and that you can feeeeeeeel the ground and form of the landscape, though you may not see it. This is the Dark Yin Way. Be a creatura of the Night! SHE is wiiiiiiiiiiise in her WILD and wondrous ways. A bit scary, but so filled with nourishment and support, that my fears soon dissolve away. One of my assignments for my final Yoga Witch Rasa Project is to research the dark goddesses, witches, shamans of my ancestry. I realized that while I so strongly relate to my Finnish lineage and their Sami shamanism, have created so much from my direct (in the bodypsyche) experience with them. I knew little of the actual history and mythic and fairy tales. In a matter of days I have stumbled into a forest of hidden treasures which have synchronistic relevance to both my journey over my life and what is unfolding in this moment. I have chosen Louhi, the Goddess Witch of the far far North! It is obvious in my learning of her that she chose me long long ago through a bloodline that mirrors what I have been writing to here in this post… the Tao of the Darkness and how to survive and thrive in it. Louhi has tremendous powers and in the mythic tome of the Finns, the Kalevala, she steals both the Sun and the Moon. To think of the far north of Finland in the heart of winter, and during a dark moon cycle, is to experience darkness like most of us have never known. To place my imagination there in that darkness while bleeding I can feeeeeeel the oracular visions which would spring forth out of it! The powers of the darkness reside in all of us. It is good to know the map, the territory we are in, for unfortunately being so removed from nature, we forget, and then fall into the wonderings of what is wrong with us. Even I who no longer has a blood cycle, wax and wane every month with the moon, more aligned with her cycles now than ever, as my hormonal cycle would change from time to time and not be in sync with the moon. yes, so Balsamic Blessings to all! Thank you for receiving this piece. The Dark New Moon will occur on Sunday, September 9th. I will offer up a playlist, perhaps journey recording, writing and suggestions for ritual before that time. May it serve. 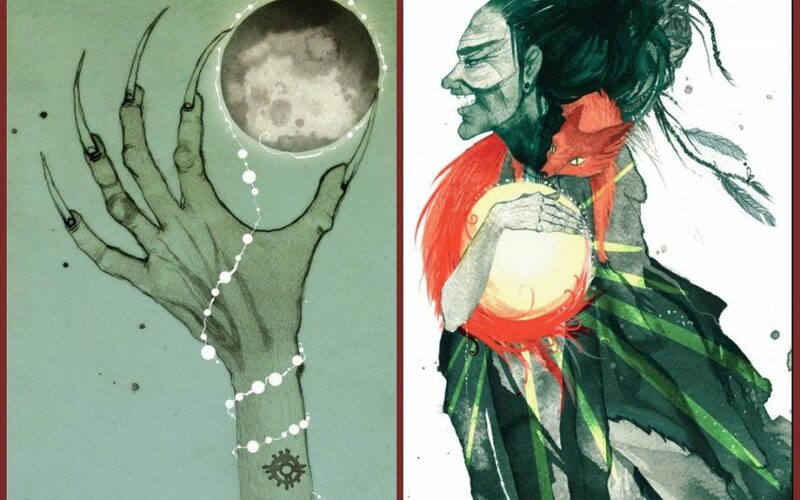 These are two prints I have purchased on etsy by a Finnish artist – Jenni Saarenkyla – Hallowed Be Her Name. Titled: Louhi steals the Moon & Louhi steals the Sun. I LOVE her face! I think I have her jaw line! Sign up for periodic Astro WITCH emails below! Success! Check your inbox for your confirmation email & mark my address as a "safe sender"